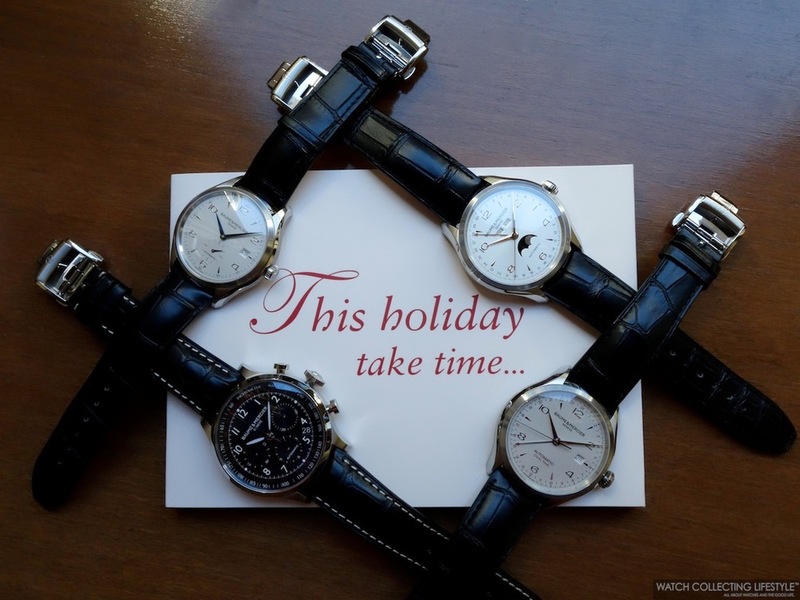 Experience: Four Baume & Mercier Watches for the Holidays Under $5K USD. Celebrate Giving. As part of the release of the first Baume & Mercier brand video titled "Home for the Holidays", we received a beautiful card in the mail with a built-in video player and a delicious snowflake-shaped shortbread cookie —unfortunately we ate the cookie before working on this post so you won't get to experience it. 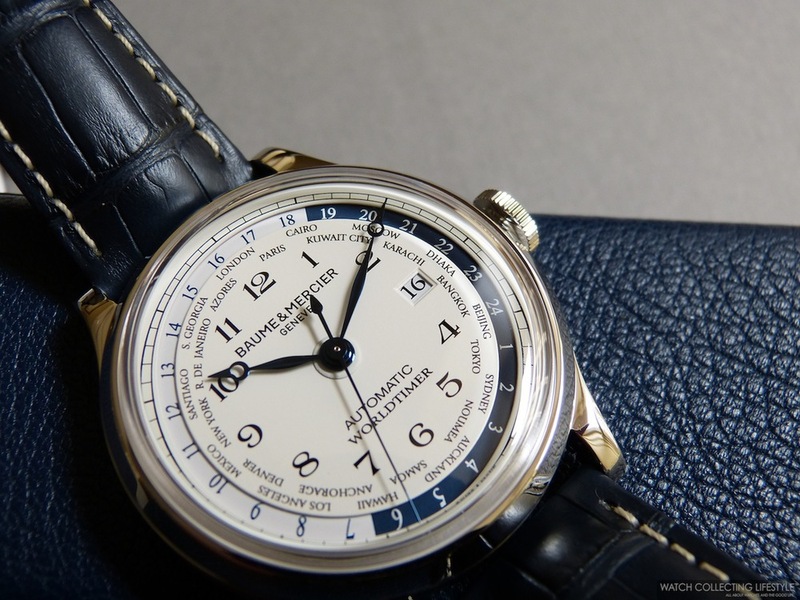 Since, today is the start of the Holiday season with Thanksgiving and Chanukah and you don't get to experience this part of the watch collecting lifestyle, we decided to work on a special post for you to see this awesome card along with four Baume & Mercier watches priced right under $5,000 USD that would make a perfect gift to celebrate giving. This is the first film in a series of films titled "Celebrate Giving" that will roll out in 2014. The film captures the spirit of family togetherness during the holiday season and the beauty of gift giving. The video is located at the bottom of this post. 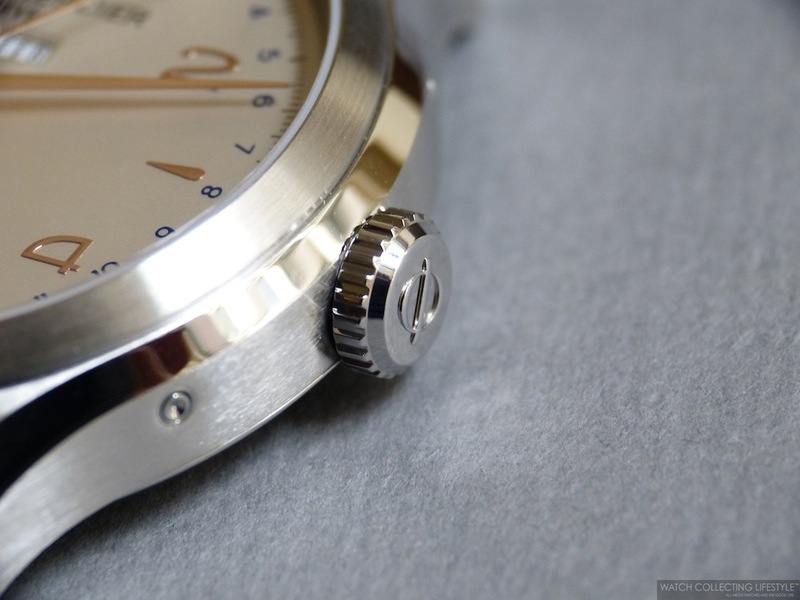 Baume & Mercier Clifton ref. 10055 Complete Calendar with Moon-phase. This is one of our favorite watches from this manufacture. It features a stainless steel case measuring 43mm in diameter, an automatic movement, a silver dial with date indicator on the outer perimeter of the dial, moon-phase indicator at 6 and day and month apertures at 12 o'clock right above the central pinion of the hands. The watch is fitted with a very comfortable and elegant black crocodile strap with deployant buckle. 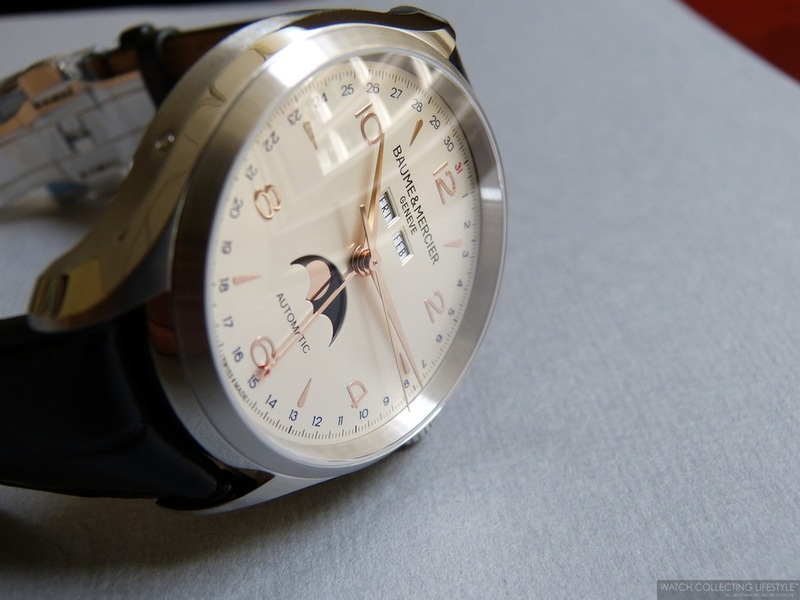 Baume & Mercier Clifton ref. 10052. This 41mm stainless steel watch also features an automatic movement and a silver dial with minute track in blue, blue anodized hands, small seconds at 6 and date aperture at 3 o'clock. Nothing too fancy, but just perfectly elegant and with a nice display case back and black crocodile leather strap with deployant buckle. Also available with black dial or silver dial with gilt Arabic numerals. 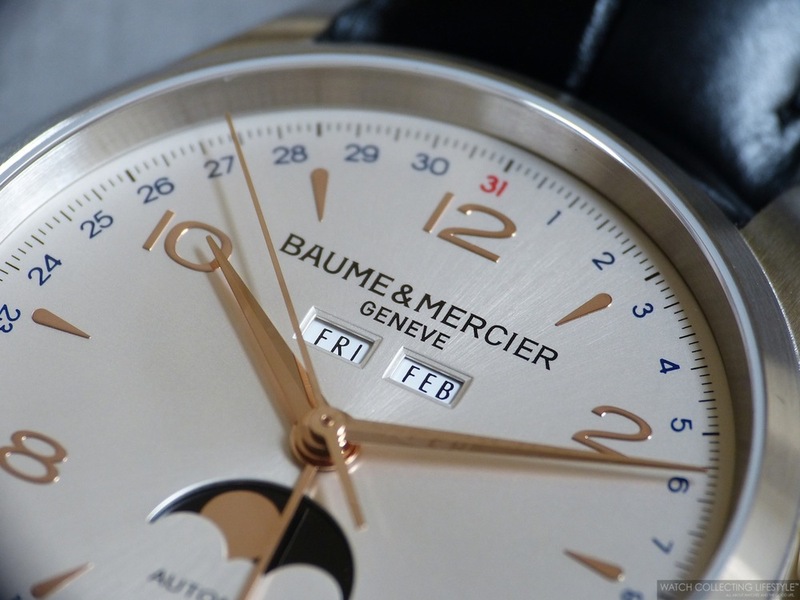 Baume & Mercier Clifton ref. 10112 Dual Time. This 43mm watch is fitted with an automatic movement and a silver dial with dual time track in red and date aperture at 3 o'clock. The second time zone is indicated by an independent hand with red tip and it is very easy to set just by pulling the crown out to the first position and rotating the crown clockwise. Also available with slate-gray dial. 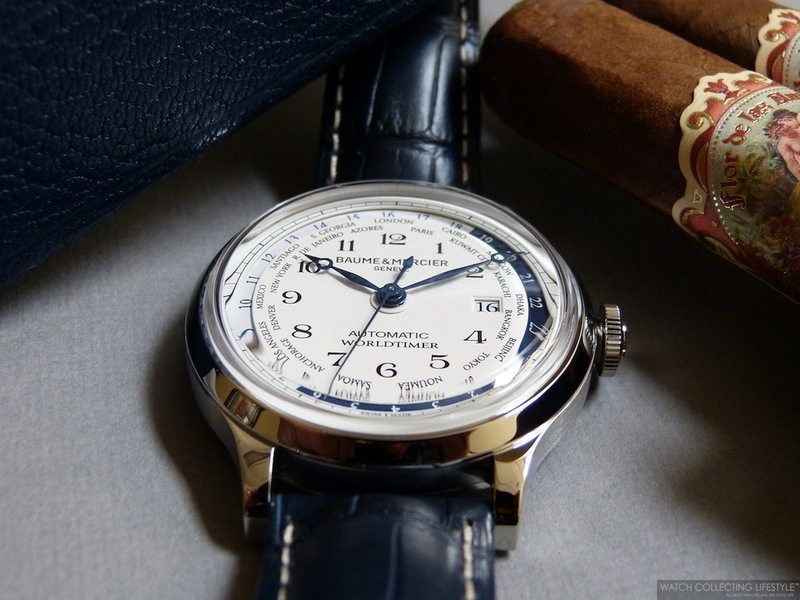 Baume & Mercier Capeland ref. 10065 Chronograph with Telemeter Scale. This beautiful stainless steel chronograph measures 44mm in diameter and features a La Joux Perret 8120 automatic calibre. The dark blue dial features a 12-hour chrono register at 6, a 30-minute chrono register at 3, a running seconds register at 9 o'clock, tachymeter and telemeter scales and a date aperture between 4 and 5 o'clock. Also available with black, silver or black dial. Now, if you find yourself struggling for which model to pick, you can just go ahead and get all four as these watches are very nicely priced. As we would say, you get a lot of watch for your buck. The #celebrategiving video is right after our mandatory wristshot. Enjoy! 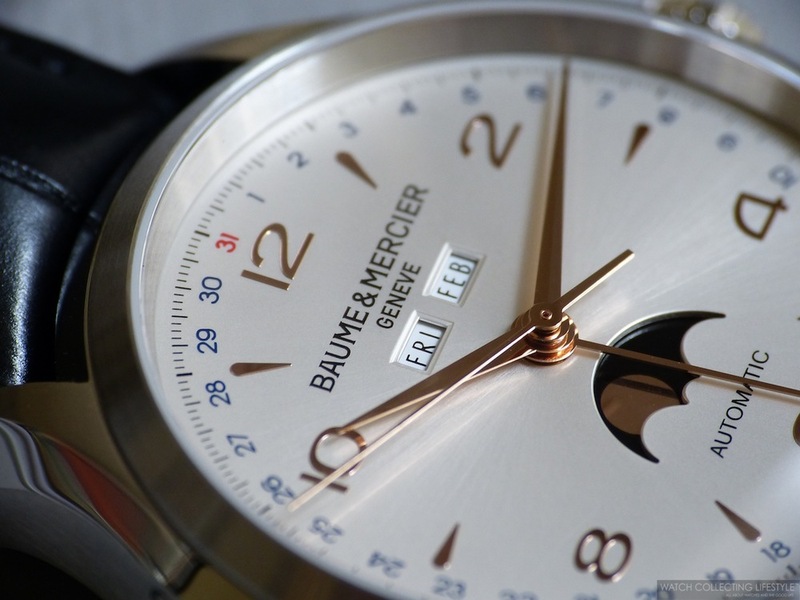 For more info on Baume & Mercier click here. Posted on November 28, 2013 by Editor & Publisher and filed under Other Brands, Baume & Mercier and tagged Baume & Mercier Capeland ref. 10065 Chronograph with Telemeter Scale Baume & Mercier Clifton ref. 10112 Dual Time Baume & Mercier Clifton ref. 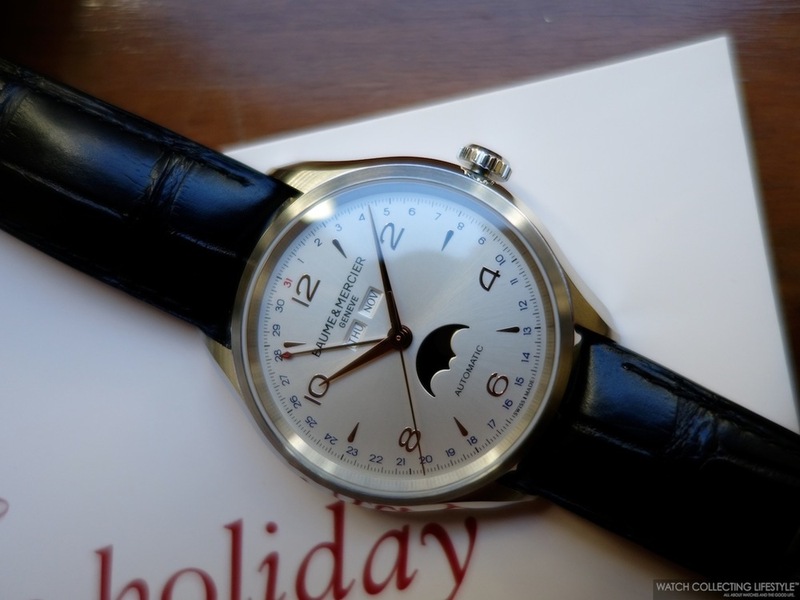 10052 Baume & Mercier Clifton ref. 10055 Complete Calendar with Moon-phase. 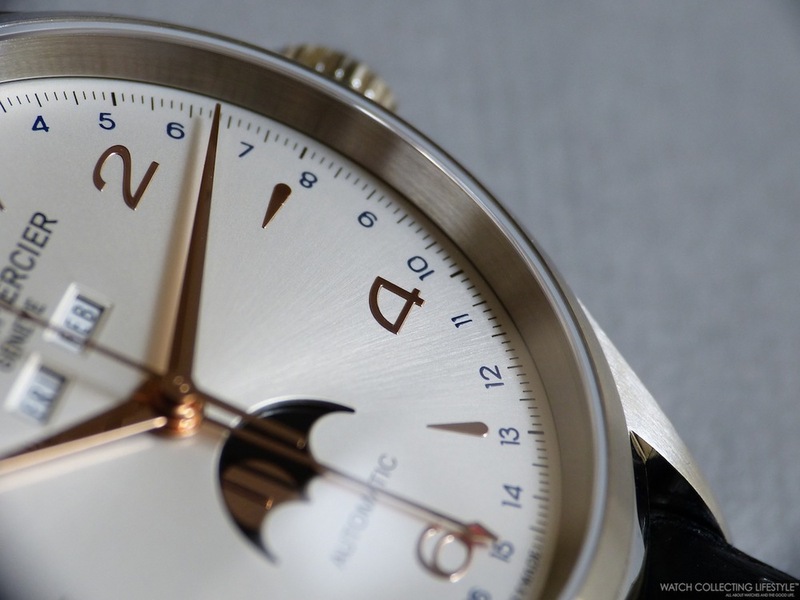 The Baume & Mercier Clifton ref. 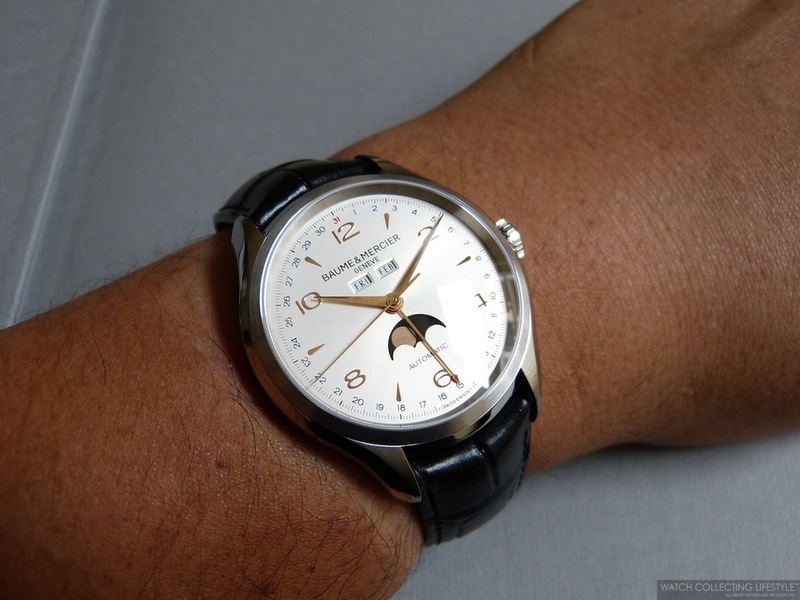 10055 is a very inexpensive and nicely executed complete calendar with moon phase. Reminiscent of other iconic complete calendars in the market, this Baume & Mercier is the most affordable option when it comes to this type of complication with a timeless design. Even though the watch is very classic looking, it is fitted with a stainless steel case measuring 43mm in diameter and 12.25mm in thickness that makes the watch look more current —based on today's standards where watches are larger than they used to be 20 to 30 years ago. This elegant looking timepiece features a sun satin-finished silver-colored dial with gilt applied Arabic numerals, markers and 'dauphine' hands. In addition to telling the time, it provides the day of the week and month information in two small apertures at 12 o'clock —right above the central pinion—, the date via a central hand with a small red tip and moon phases in a large aperture at 6 o'clock. The number 31 on the calendar chapter ring is marked in red to add a nice matching touch to the red tip on the date indicator hand. This timepiece is fitted with an automatic calibre that provides a power reserve of 42 hours when fully wound. The calibre is fully visible through the display case back and while it is nothing really fancy or out of this world, it is nicely finished with some 'perlage' on the bridges and 'Côtes de Genève' on its rotor. This watch is fitted with a black alligator strap —that is somewhat stiff and might need a good break-in period— with a triple folding buckle with security push buttons on the sides and a very clever system where the strap never gets marked by the pressure of the deployant buckle when adjusting it to the right length. The strap is a perfect match to the elegant and timeless design of this complication. In order to ease the setting of the date, day, month and moon phase on this watch, there are four very discreet and conveniently located push-pieces on both sides of the case. On the wrist, this watch wears very comfortably and true to its size on a 7-7.25" wrist. While on the picture below the watch might appear to sit high on the wrist, it can easily be tucked under a french cuff without any problems. 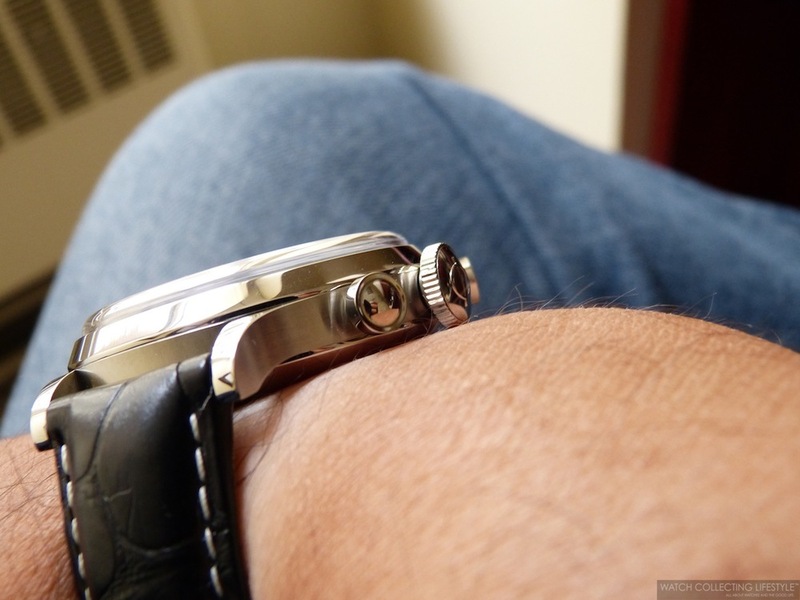 The watch feels solid but not top heavy and its wrist presence is spectacular. The watch is also available with a gorgeous —very seventies looking— blue dial as ref. 10057. Sticker Price $4,950 USD. 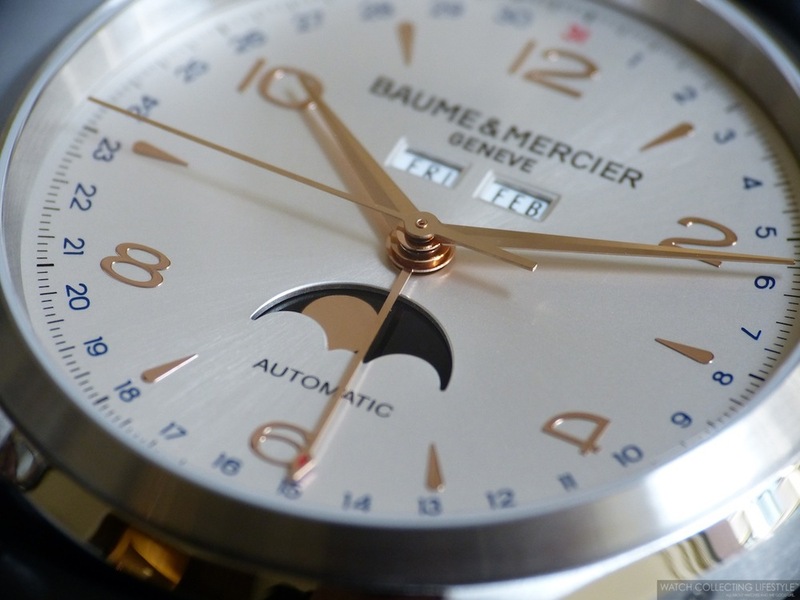 For more info on Baume & Mercier click here. Posted on August 16, 2013 by Editor & Publisher and filed under Other Brands, Baume & Mercier and tagged Baume & Mercier Clifton ref. 10055 Complete Calendar Baume & Mercier Baume & Mercier Complication Baume & Mercier Clifton ref. 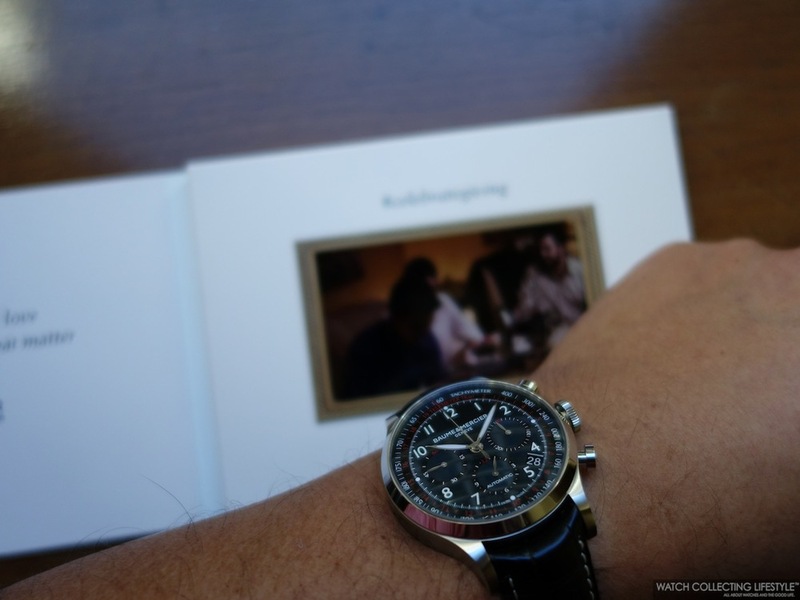 10057 Posts 2013.
Insider: Baume & Mercier Capeland Flyback Chronograph. Telemeter and Tachymeter Scales in One Watch. Before we start talking about this fantastic watch, we need to take a pause and mention how impressed we are with the new timepieces from this legendary manufacture. From their Capeland Worldtimer to their Clifton Annual Calendar with Moonphase and now this Flyback Chronograph, Baume & Mercier definitely got its groove back. This beautiful Baume & Mercier Capeland Flyback Chronograph in stainless steel ref. 10006, is inspired by a model released in 1948 but with some subtle differences. Featuring the now traditional pebble-shaped case measuring 44 mm in diameter and a domed sapphire crystal, this watch has an unparalleled vintage look. The satin-brushed finished case along with the polished bezel, crown and pushers create a perfect horological symphony in all the sense of the word. The crown is nice and big, easy to use and the pushers offer the right resistance to pressure when activating the chrono function. The watch is fitted with a beautiful but somewhat busy off-white dial displaying two registers —one for the running seconds and the other a 30-minute chrono register—, a date aperture between 4 and 5 o'clock and two graduated scales —one is a tachymeter and the other a telemeter. The contrast created by the anodized Breguet style blue hands against the off-white colored dial is perfect and also a great match to the blue concentric tachymeter scale on the center of the dial. 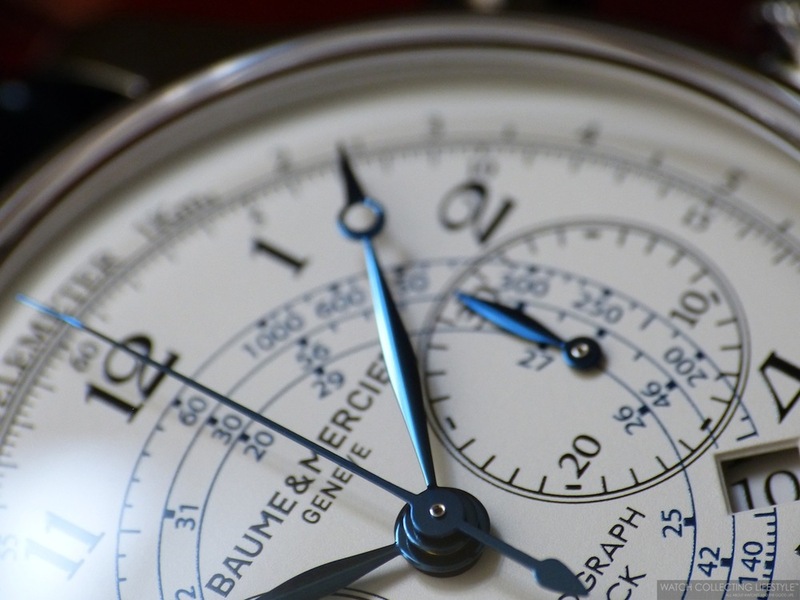 A telemeter chronograph allows the user to approximately measure the distance to an event that can be both seen and heard —i.e. lightning—using the speed of sound. The user should start the chronograph at the instant the event is seen and stop it at the moment the event is heard. The chrono seconds hand will point to the distance measured on the scale around the edge of the face. The telemeter scale shows kilometers in the case of this watch. 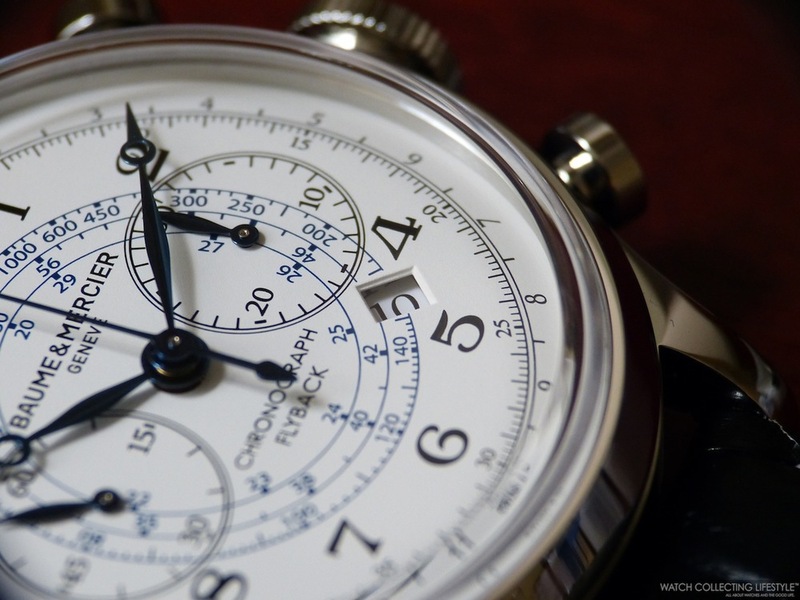 A flyback chronograph is a chrono where the user can reset the chrono on the fly —by pushing the reset pusher— in order to take a second time measurement without the need to stop the chronograph first. The display case back allows for full view of the La Joux Perret 8147-2 automatic movement with flyback chrono function and 27 jewels that provides a power-reserve of 42 hours when fully wound. 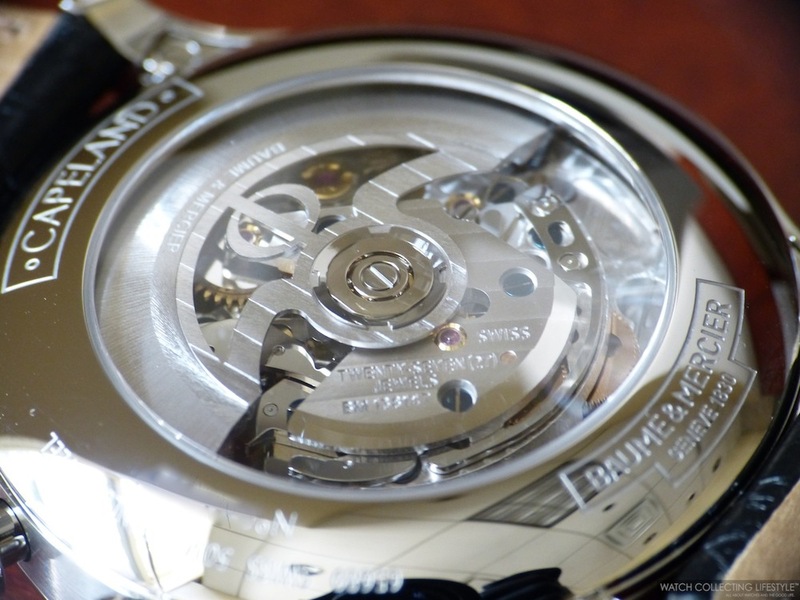 The movement is nicely decorated with 'Côtes de Genève' and 'perlage'. 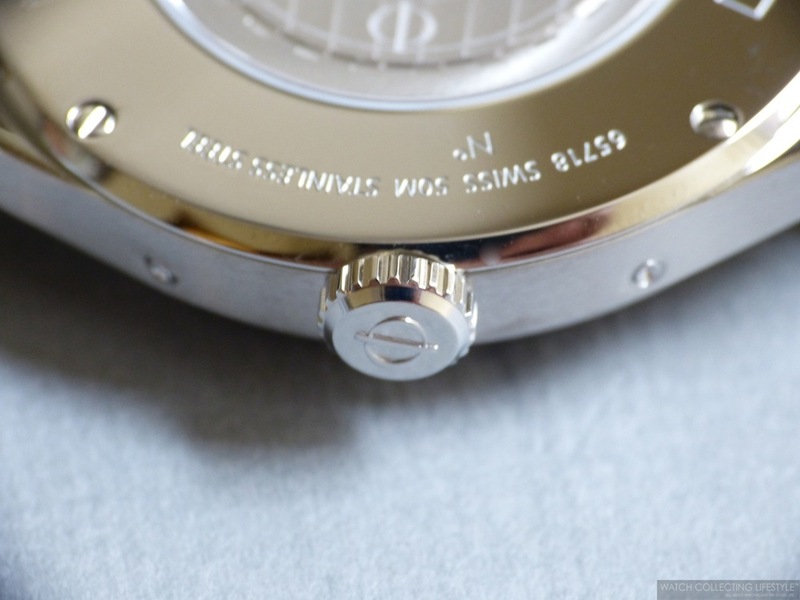 The rotor features a cut-out with the Baume & Mercier Phi symbol and the brand's name. The watch wears very comfortably as it is fitted with a black alligator strap with pin buckle. As you can see in the pictures, the watch wears larger than its size and more like a 46 mm due to the pebbled-shape of the case and the thin bezel. It's also important to mention that the watch sits high on the wrist —16.5 mm in thickness— but not in an uncomfortable way. The vintage look and feel of this timepiece is unparalleled and it's a perfect watch that can be worn dressed up or dressed down. Sticker Price $7,500 USD. 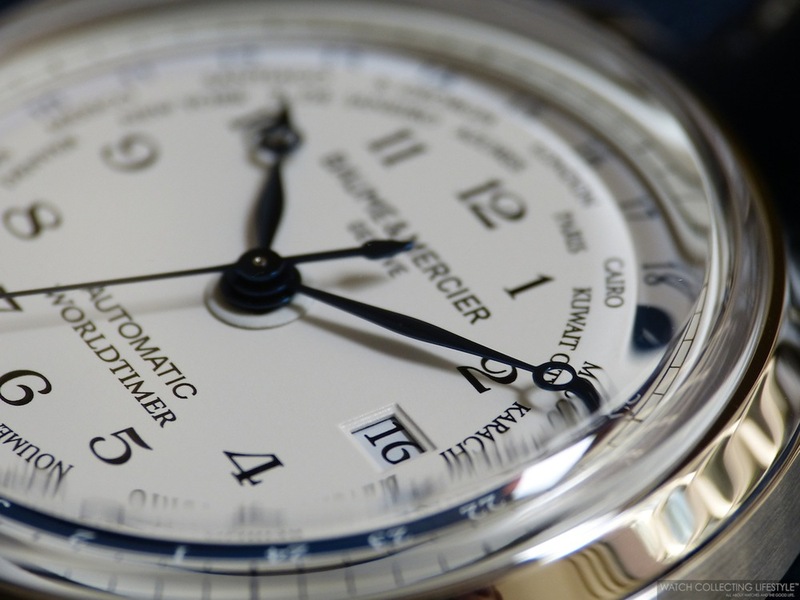 For more info on Baume & Mercier click here. Posted on August 1, 2013 by Editor & Publisher and filed under Other Brands, Baume & Mercier and tagged Baumer & Mercier Capeland ref. 10006 Baume & Mercier Capeland Flyback Chronograph La Joux Perret 8147-2 Automatic Calibre Telemetric Scale Price for Baume & Mercier Capeland Flyback Chronograph. A few weeks ago we presented our review of the Girard-Perregaux WW.TC Financial Power Reserve Worldtimer ref. 49850-11-152-BA6A, a watch that, along with Frédérique Constant's Worldtimer, is one of our favorite worldtimer watches in the market. This time, we are presenting the beautiful and well balanced Baume & Mercier Capeland Worldtimer. 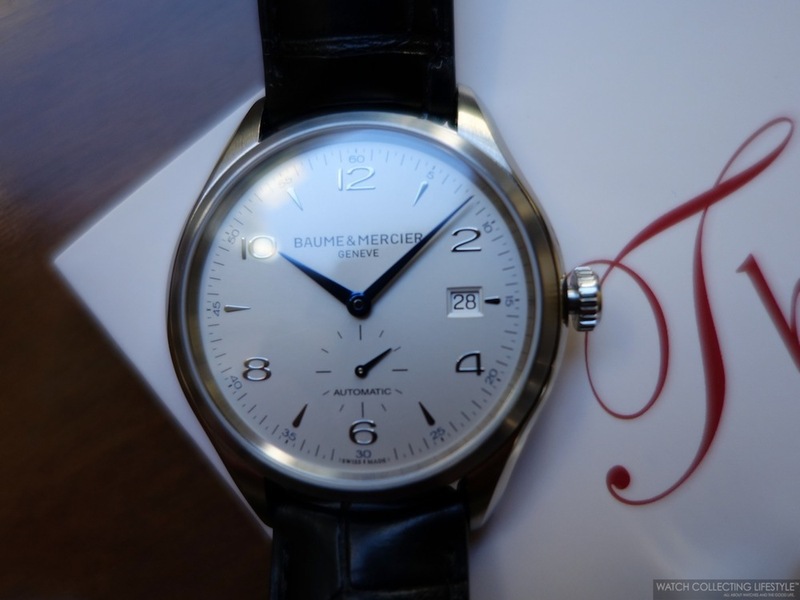 Baume & Mercier a.k.a. the 'Maison D'Horlogerie' was established in 1830 in Genève and since then, they have been offering beautiful classic watches at very reasonable prices. After perusing the Capeland Worldtimer a few weeks ago, we can confidently say that it is one of the best options in the market if you are looking to buy a well made and perfectly executed worldtimer timepiece. This watch is available in stainless steel or 18K red gold and from what we've heard through the grapevine, it features a Richemont calibre that seems to be the same movement fitted on the IWC Pilot's Watch Worldtimer. The Baume & Mercier Capeland Worldtimer is a large classic looking watch featuring a 44 mm case, a blue alligator strap and a display case back. The watch fits like a glove and the readability of the dial is unparalleled. If you want to get into the world of complications, getting this worldtimer is a great option. Sticker Price $7,900 USD. For more info click here. 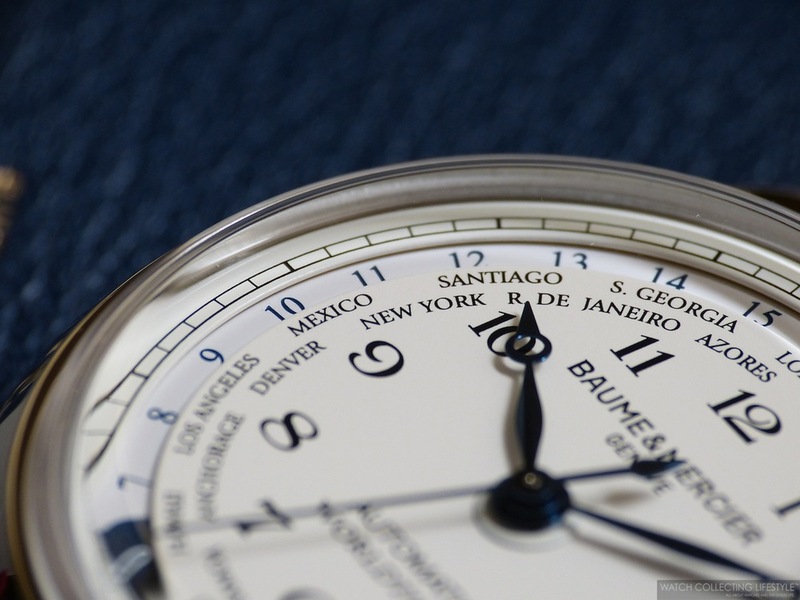 Posted on July 9, 2013 by Editor & Publisher and filed under Other Brands, Baume & Mercier and tagged Baume & Mercier Capeland Worldtimer Worldtimer Flor de las Antillas Baume & Mercier Posts 2013.